Reading and share top 102 famous quotes and sayings about Delusions by famous authors and people. Browse top 102 famous quotes and sayings about Delusions by most favorite authors. 1. "The house of delusions is cheap to build but drafty to live in." 2. "The act of gaining true insights from self - reflection is a futile action for most ... as there are easy way out things like self justification, rationalization, delusions and denial which keeps us away from our true self, the inner core and thus we live contented"
3. "Aristotle raped reason. He implanted in the dominant schools of philosophy the attractive belief that there can be discrete separation between mind and body. This led quite naturally to corollary delusions such as the one that power can be understood without applying it, or that joy is totally removable from unhappiness, that peace can exist in the total absence of war, or that life can be understood without death.—ERASMUS, Corrin Notes"
4. "Don Quixote's 'Delusions' is an excellent read - far better than my own forthcoming travel book, 'Walking Backwards Across Tuscany.'" 5. "Mothers do not have love affairs. Before their children they have dreams, and after their children they have delusions. If the father is involved somewhere, they have fantasies." 6. "I'm so incredibly tired of giving respect to a lot of delusions and crazy ideas just because they are regarded as religions." 7. "Worship means reverence and humility it means revering your real self and humbling delusions." 8. 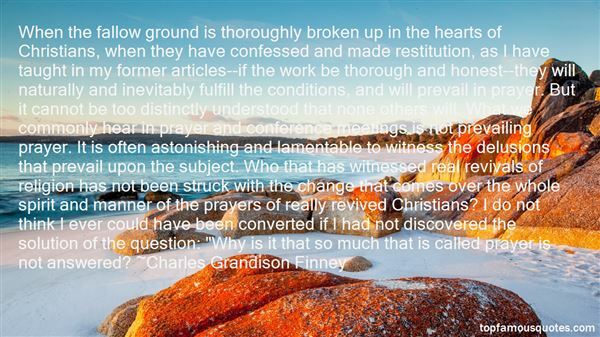 "When the fallow ground is thoroughly broken up in the hearts of Christians, when they have confessed and made restitution, as I have taught in my former articles--if the work be thorough and honest--they will naturally and inevitably fulfill the conditions, and will prevail in prayer. But it cannot be too distinctly understood that none others will. What we commonly hear in prayer and conference meetings is not prevailing prayer. It is often astonishing and lamentable to witness the delusions that prevail upon the subject. Who that has witnessed real revivals of religion has not been struck with the change that comes over the whole spirit and manner of the prayers of really revived Christians? I do not think I ever could have been converted if I had not discovered the solution of the question: "Why is it that so much that is called prayer is not answered?" 9. "Daydreams are the delusions of the devil." 10. "With mania, is it dangerous to ride that euphoric feeling. You feel very animated and creative; I would fill journals with drawings. It feels good and you want it to last, but it can lead to being delusional. The delusions can be as real as you thinking you can fly." 11. "The imagination can be a kind of wilderness, too, in fact a wasteland, if you allow it to take you into one bleak and grotesque place after another, for you can imagine yourself into all kinds of paranoid delusions and even into madness." 12. "After all your years climbing around in people's heads like a cranial janitor, do you think people know why they do things? People rationalize, they turn their delusions into something romantic that they can disguise as ethics or principles or ideals. People are selfish, Doctor- odiously, monstrously, but in so small and paltry a monstrousness that we barely notice it." 13. "The word God has become empty of meaning through thousands of years of misuse... By misuse, I mean that people who have never glimpsed the realm of the sacred, the infinite vastness behind that word, use it with great conviction, as if they knew what they are talking about. Or they argue against it, as if they knew what it is they are denying. This misuse gives rise to absurd beliefs, assertions, and egoic delusions, such as "My or our God is the only true God, and your God is false," or Nietzsche's famous statmeent "God is dead." 14. "We're soldiers, Emily. If we're not elders or council members then that's all we are. We're here to serve those above us. We're novel worthy, day walking, blood sucking, tortured souls trapped in a body that can't die for all eternity with no feelings, no emotions and no heart. We don't get to feel love, passion or desire. We do as we're told, for the good of the clan and because we're told to do it. And we protect people. So whatever grand delusions you have about being some kind of wonderful child and the master's favorite are just misguided attempts to feel human again. Get over it." 15. "Practically all writers and artists are aware of their destiny and see themselves as actors in a fateful drama. With me, nothing is momentous: obscure youth, glorious old age, fateful coincidences — nothing really matters. I have written a number of good sentences. I have kept free of delusions. I know I am going to die soon." 16. "And so, onwards... along a path of wisdom, with a hearty tread, a hearty confidence.. however you may be, be your own source of experience. Throw off your discontent about your nature. Forgive yourself your own self. You have it in your power to merge everything you have lived through- false starts, errors, delusions, passions, your loves and your hopes- into your goal, with nothing left over." 17. "The Spirit and theWord must be combined. If I look to the Spirit alone without the Word, I lay myself open to great delusionsalso. If the Holy Ghost guides us at all, He will do it according to the Scriptures and never contrary to them." 18. "Vonnegut's war was necessary. And yet it was massacre and screaming and confusion and blood and death. It was the mammoth projection outward of the confused inner life of men. In war, the sad tidy constructs we make to help us believe life is orderly and controllable are roughly thrown aside like the delusions they are. In war, love is outed as an insane, insupportable emotion, a kind of luxury emotion, because everywhere you look, someone beloved to someone is being slaughtered, by someone whose own beloved has been slaughtered, or will be, or could be." 19. "Always suffer delusions of grandeur with your art. What you are unable to face will never hurt you"
20. "Behind lay loneliness and delusions. Ahead lay answers, and yes, Riley. So bent double beneath my load, but naked no longer, I followed the two demons deeper into Hell." 21. "Whatever plane our consciousness may be acting in, both we and the things belonging to that plane are, for the time being, our only realities. As we rise in the scale of development we perceive that during the stages through which we have passed we mistook shadows for realities, and the upward progress of the Ego is a series of progressive awakenings, each advance bringing with it the idea that now, at last, we have reached "reality"; but only when we shall have reached the absolute Consciousness, and blended our own with it, shall we be free from the delusions produced by Maya [illusion]." 22. "...for whether we want to or not, we belong to our time and we share in its opinions, its feelings, even its delusions." 23. "Shams and delusions are esteemed for soundest truths, while reality is fabulous." 24. "Schizophrenia: A psychotic disorderncharacterized by withdrawal from reality, illogical patterns of thinking, delusions, and hallucinations. See also: Nightmare." 25. 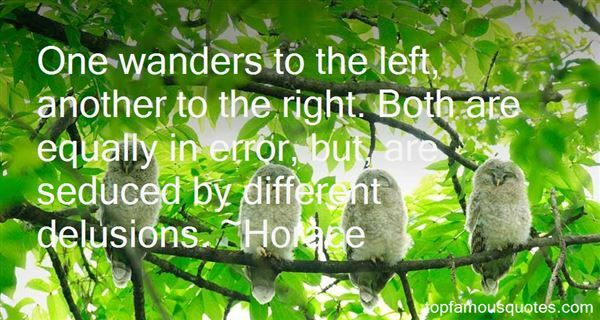 "One wanders to the left, another to the right. Both are equally in error, but, are seduced by different delusions." 26. "Never during its pilgrimage is the human spirit completely adrift and alone. From start to finish its nucleus is the Atman, the god-within... underlying its whirlpool of transient feelings, emotions, and delusions is the self-luminous, abiding point of the transpersonal god. As the sun lights the world even when cloud-covered, "the Immutable is never seen but is the Witness; it is never heard but is the Hearer; it is never thought but is the Thinker; it is never known but is the Knower. There is no other witness but This, no other knower but This." from the Upanishad"
27. "Self-mortification, far from producing liberation from material things, is far more likely to cause either an unhinged mind, delusions or a masochistic taste for more suffering, experienced, of course, as joy." 28. "I began dividing life in absolutes... Things and people were either perfectly bad, or perfectly good, and when life didn't obey this black-and-white rule, when things or people were complex or contradictory, I pretended otherwise. I turned every defeat into a disaster, every success into an epic triumph, and separated all people into heroes or villains. Unable to bear ambiguity, I built a barricade of delusions against it." 29. "Delusions of grandeur make me feel a lot better about myself." 30. "Delusions are a vital part of my existence." 31. "I'd like to be the commissioner of tennis, but do I want to get into politics? Sometimes I have delusions of grandeur that that would be an interesting, good thing. I'm talking about actual politics, like being a congressman, but then I see how unbelievably nasty it really is, and maybe I'm not quite knowledgeable enough to actually do it." 32. "...Don't rupture another's illusion unless you're positive the alternative you offer is more worthwhile than that from which you're wrenching them. Interrogate your solipsism: Does it offer any better a home than the delusions you're reaching to shatter?" 33. "On Internment, you can be anything you dream--a novelist or a singer, a florist or a factory worker. You can spend entire afternoons watching clouds so close it's as though you're riding on them. Your life is yours to embrace or to squander. There's only one rule: You don't approach the edge. If you do, it's already over. My brother is proof of that. He has successfully quieted my delusions I held about seeing the ground for myself." 34. "Many have made a trade of delusions and false miracles, deceiving the stupid multitudes." 35. "Feminists amuse me more than illusionists. They are the only type of people that can make an illogical argument seem even more illogical with paintings of delusions." 36. "Vaccination is a barbarous practice and one of the most fatal of all the delusions current in our time.Conscientious objectors to vaccination should stand alone, if need be, against the whole world, in defense of their conviction." 37. "A suspicious, insecure mind is proof that one's heart is stuck in the past. The past will undoubtedly sabotage the future by poisoning the present, which only leads the one harboring suspicion to believe that their delusions of deceit and infidelity on the part of their partner, are in fact the truth. Be cautious, be understanding, but when it starts to deteriorate- escape with your sanity before your heart ends up broken." 38. "I used to think I was a singer; I had my own delusions about it." 39. "The last act was to infect me with nightmares and paranoid delusions that would take years of therapy and metabolism-wrecking medications to rout out." 40. "Sadly, many storytellers and artists are still addicted to the old delusions (happy is boring, evil is interesting) about the risks of good mental health. Even those who don't view peace of mind as a threat to their creative power often believe that it's a rare commodity attained through dumb luck….It's possible to define a more supple variety of happiness that does not paralyze the will or sap ambition….the number one trait of happy people is a serious determination to be happy. Bliss is a habit you can cultivate, in other words, not an accident." 41. "If you are proven to be right a hundred times in a row,no amount of evidence will convince you that you are mistakenin the hundred-and-first case. You will be seduced byyour own apparent infallibility. Remember that all scientificexperiments are performed by human beings and the resultsare subject to human interpretation. The human mind is adelusion generator, not a window to truth. Everyone, includingskeptics, will generate delusions that match their views.That is how a normal and healthy brain works. Skeptics arenot exempt from self-delusion." 42. "Delusions are hardly an escape from reality. It's a way of understanding insane people living in a backwards world." 43. "It'll be all right, Clay. Really." "So you say, but you have a persecution complex and delusions of grandeur." "That's true," Tom said, "but they're balanced out by poor self-image and ego menstruation at roughly six week intervals..."
44. "Strong delusions travel like cold germs on a sneeze." 45. "In many ways, life is about managing your delusions; keeping the ones that nourish and eliminating the ones that poison." 46. "The point I'm making," said Yo-Less, "is that you've got to help your friends, right?" He turned to Johnny. "Now, personally, I think you're very nearly totally disturbed and suffering from psychosomatica and hearing voices and seeing delusions," he said "and probably ought to be locked up in one of those white jackets with the stylish long sleeves. But that doesn't matter, 'cause we're friends." 47. "Reclaimed by the small-time day-to-day, pretending life is Back To Normal, wrapping herself shivering against contingency's winter in some threadbare blanket of first-quarter expenses, school committees, cable-bill irregularities, a workday jittering with low-life fantasies for which "fraud" is often too elegant a term, upstairs neighbors to whom bathtub caulking is an alien concept, symptoms upper-respiratory and lower-intestinal, all in the quaint belief that change will always be gradual enough to manage, with insurance, with safety equipment, with healthy diets and regular exercise, and that evil never comes roaring out of the sky to explode into anybody's towering delusions about being exempt. . ."
48. "I mean what they and their hired psychiatrists call delusional systems. Needless to say, ‘delusions' are always officially defined. We do not have to worry about questions of real or unreal. They only talk out of expediency. It's the system that matters. How the data arrange themselves inside it. Some are consistent, others fall apart." 49. "Doubt is the big machine. It grinds up the delusions of women and men." 50. "Truly, there are no justified ways to how a mule tramples the earth, but who would be burdened to hear such an obscurity? We do not gaze upon stars to appertain affection towards them, rather to sooth our contempt fallacy of an ill-placed apprehension of them. Who concern themselves with anything if not genuine in their convictions? Delusions? I am flattered no less." Running would help with the weight, but the weight did not help with running."